Getting children excited about history is as easy as introducing it in a way that is interesting. We also seek out hands on workshops, or an interactive historic locales. But what about religious history? Especially when it’s not your own? Is there even a point? All history is important as knowledge is power. Armed with knowledge, one can form opinions, make decisions. William Blake said, “Knowledge is life with wings.” Hence, when looking for Things To Do In Salt Lake City in One Day, history is a good place to start. Strolling Salt Lake City, heading for The Garden Restaurant. History is knowledge with the added benefit of hindsight! As a homeschooling mom, it is my responsibility to present my children with as many opportunities to gain knowledge as possible. As a Catholic family, our religion does not closely align with Mormonism. However, Salt Lake City is almost entirely rooted in The Church of Jesus Christ of Latter Day Saints (LDS). Therefore, it’s of interest to us as we travel and learn about the places we stop. Visitng Salt Lake City in One Day is not an ample amount of time. However, we chose 3 things we thought would be great fun. 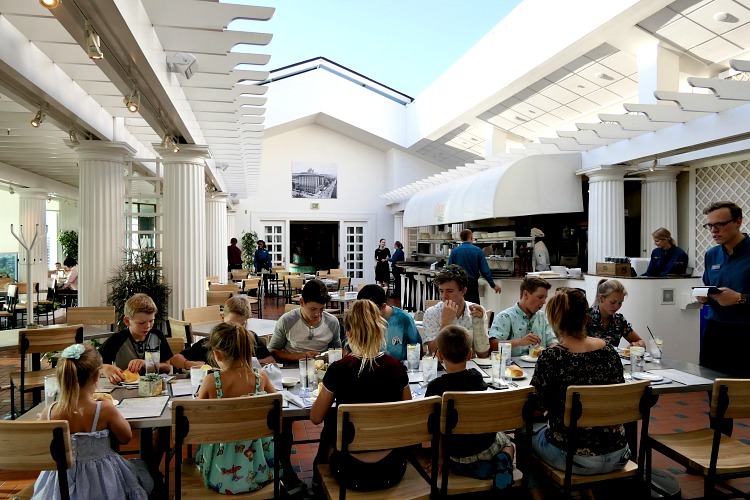 We chose spots that would give us insight into Salt Lake City’s history, satisfy our kids’ need to be wowed, and fuel our bodies with delicious foods. There are tons of fun family activities that make up for a great family vacay, but we had one day to explore. Below are 3 Things To Do In Salt Lake City in One Day. The Garden Restaurant was so delicious, the service was amazing and the ambiance was incredible! When you are doing Salt Lake City in One Day, with 13 people, food is at the top of our list. The Garden Restaurant was phenomenal. Located on the 10th floor of the Joseph Smith Memorial Building, in the middle of Temple Square, it offers panoramic views of the City and open-air charm, compliments of the retractable glass roof. The Garden Restaurant menu is very well-rounded and fairly priced. Kids meals are a very reasonable $5. That is a biggie for us, as dining out with our large crew can become financially unfeasible. The dinner menu had everything from meatloaf to shrimp macaroni and cheese and everything in between. The presentation of our meals was on point which, of course, set up our expectations for greatness. Now, I say this as a major dessert connoisseur…if you only go to The Garden Restaurant for one thing, on the entire menu, order the dessert. We ordered one Creme Broule’ and one Salted Caramel Chocolate Cake and there was enough for everyone to have their fill. The dessert portions are enormous and absolute perfection. Second only to food, service is paramount to a good experience. Mind you, we are a large party, and there were a lot of orders to take, a lot of refills of water and a plethora of drinks to manage. Our server met all our expectations as he did not miss either a drink nor did he make a single mistake regarding our order. Of all the possible Things to Do in Salt Lake City in One Day, I recommend finding The Garden Restaurant! 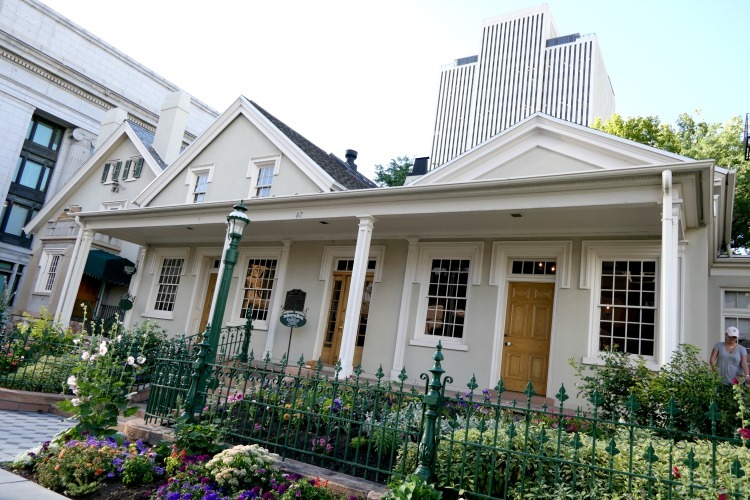 The Beehive House was the home to Brigham Young and is one of many free activities in Temple Square. So, Brigham Young is a big name in and around the state of Utah, and very specifically in Salt Lake City. 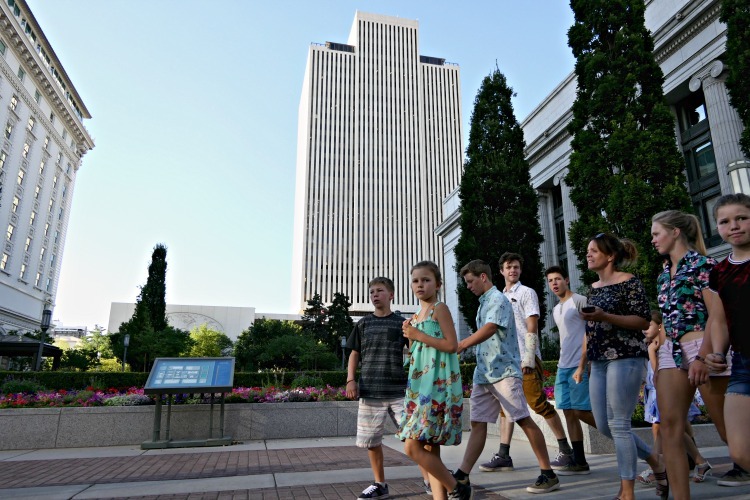 So in our quest to find educational Things To Do In Salt Lake City in One Day, we thought it wise to learn about Brigham Young. I mean there is even a college here named after the man. I thought it would be interesting to learn a little about who he was and what his life was like way back in the day. Funny story, the kids thought we were literally going to a house where there were actual beehives … needless to say, I think they were a little disappointed. My expectations were way off from what this tour delivered. I expected it to be an historical tour as it was dubbed a museum. I have to be honest, I was disappointed. It was delivered as more of a religious mission than as a tour of the life and times of Brigham Young. In fact, we learned very little about the man and his trek from IL to Salt Lake City. Not much was said about life in those days. I had to ask all the pertinent questions. Like, when he was born, when he came to SLC, how many wives, how many children, how he supported them all, what did he do, etc. What I will say about this tour is that it prompted us to do our own research. The more we researched, the more questions we had. And, as we researched, the more we veered off from the religious to the politics of the city. We talked about how Salt Lake City politics may be influenced by the LDS faith. In hindsight, visiting the Beehive House was not what I expected, but it did offer the opportunity to learn and to discuss a part of life we too often take for granted. 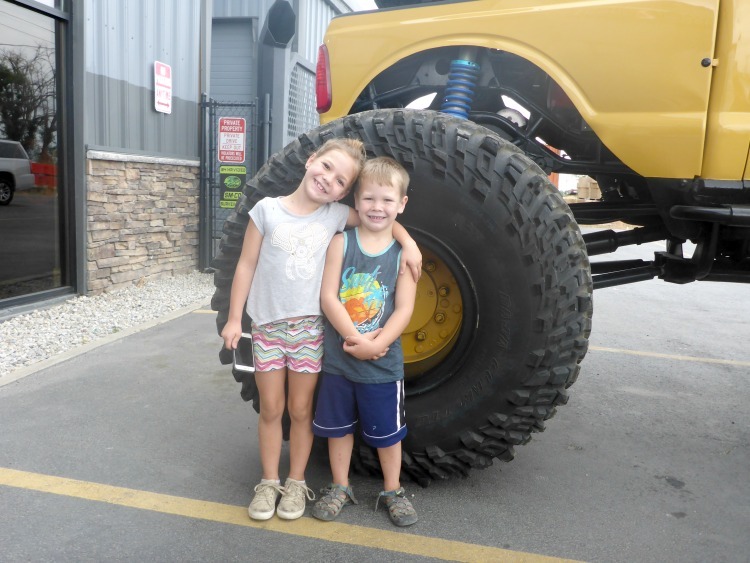 A must see spot for our kids – Diesel Sellerz! When deciding on Things To do In Salt Lake City in One Day, Diesel Sellerz is way up there. We blessed Diesel Sellerz with our presence. And, while this is unlike me as a traveler as any trendy, touristy stop could be, my kids begged. They all have the dream to actually morph into The Diesel Brothers. Even my 5 year old, Coby, was adamant that we stop in Salt Lake City to see these guys. The Diesel Sellerz shop also happens to be where they do all their filming. When you pull up, you actually see several of the builds from their show. We saw Hercules. We saw the Bro Dozer, the El Camino, the Fail of the Year, the Freedom Bus and more. The store itself simply has merchandise from which we bought a shot glass to add to our collection. I was surprised by how much Coby really wanted to meet “the guys”. I knew he’d love the trucks, but I didn’t think for one second he’d give two hoots about the actual Diesel Brothers. He sat on the bar stools looking into the garage waiting and waiting. If your kids are interested in Monster Truck builds, this is a really cool quick stop to make. And the fact that it is just outside the city makes it a great Thing to Do in Salt Lake City in One Day. 7 Things About Raising 7 Boys You Need To Know! What a fun day to spend with your kids. I did spend a few days in Salt Lake, but never visited The Bee Hive Home and after seeing your post I feel like I missed a very important part of the History of Salt Lake.